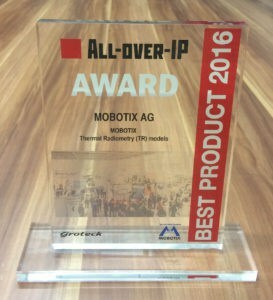 Moscow, Russia/Langmeil, Germany, 12 December 2016 At this year’s All-Over-IP security trade fair, which was held in Moscow at the end of November, MOBOTIX celebrated two successes. 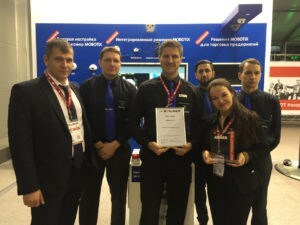 They were the only manufacturer in the field of IP video security to win the “Best Product” award, which went to their thermal radiometry camera models. These models can provide alerts for up to 20 different kinds of temperature events in a range from -40 to +550°C, which is decisive in detecting sources of fire and heat. MOBOTIX won another award in the “Next Big Thing” category for their new plug-and-play solution, a preconfigured complete IP video system for the front door. “We have succeeded in bringing home awards from All-over-IP for the third time. I’m very proud of that,” said Mikhail Chichvarin, Business Development Manager Russia & CIS countries. At the trade fair, MOBOTIX focused on presenting their innovative solutions for industrial applications and retail as well as the new plug-and-play models. The newly designed trade fair booth, which exclusively featured Russian text for the first time, was very popular with visitors. Partners, journalists and many new interested parties praised the booth’s open look and feel, and were thrilled by the MOBOTIX solutions on show. MOBOTIX topped off their appearance at the Moscow event with a specialist lecture by Project Manager Matteo Lugaresi entitled “Blending Technologies for a better living: CCTV as you’ve never seen it before.